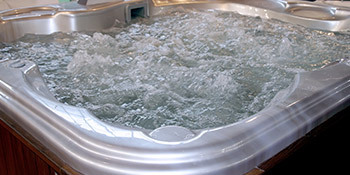 Hot tubs can be large or small pools of heated water. They’re popular for a number of reasons including relaxation, hydrotherapy and massage, providing a number of health benefits. Hot tubs are often found outside and sheltered from the elements and for privacy. They’re heated by electric or gas, depending on your preferences, and can also be environmentally friendly, powered by solar panels and biomass heating. Medical conditions such as diabetes and arthritis. With a hot tub you can ease stress problems and even improve your night’s sleep. With a combination of heat and massaging jets, tension is reduced, making it easier to sleep. This is backed up by expert research too, which suggests a 15 minute hot tub session can lead to improved sleep. In the same way that a hot tub will help to relieve stress, the massaging jets with work to relax muscle and joint aches and pains. The water’s buoyancy helps to reduce body weight by 90%, relieving excess pressure on joints. The Arthritis Foundation even recommends hot tubs as a way to relax muscles, decrease stiffness and improve daily life activities. With the hot tub’s heat, blood vessels open up, in turn decreasing your pressure. The heat and massaging benefits improve blood flow whilst also assisting the immune system and digestion. With the amazing health benefits hot tubs provide, they’re something most homeowners should consider to improve their way of life. For up to four FREE quotes from local, vetted and reputable companies, simply fill out your details in our quick form. Project: Replace damage sewer pipe and make good all connections and back fill. Kevin was prompt polite and solved the issuse.